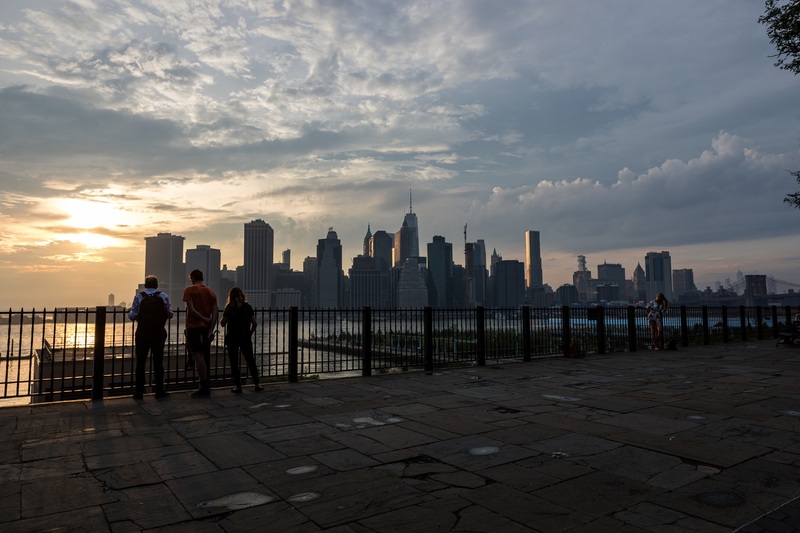 The city’s Department of Transportation (DOT) is backing a plan that would temporarily replace the famous Brooklyn Heights Promenade with a six-lane highway during the reconstruction of the Brooklyn-Queens Expressway (BQE) between Atlantic Avenue and Sands Street. DOT says the plan, in which 153,000 vehicles a day would rumble past the back doors of some of the most valuable real estate in Brooklyn, would allow the rehab of the decrepit 1.5 mile stretch of roadway to be completed in six years, as opposed to eight or more years using the typical incremental, lane-by-lane repair approach. The incremental approach could back traffic up for miles, especially if the operating traffic lanes became blocked, DOT says. Thousands of trucks from the BQE could be diverted onto the streets of Brooklyn if repairs on the ageing structure aren’t completed before it reaches its expiration date in 2026. Construction could start in 2023. The stretch includes the BQE’s triple cantilever underpinning the Promenade. DOT would tear down the existing Promenade (along with its trees) to build the six-lane roadway, which could take about a year and a half to install. BQE traffic would move up to the Promenade level, opening up the levels below for construction. At the north end of the Promenade, the temporary highway would cut across Columbia Heights near Cranberry Street — an area that most people do not realize is actually a bridge over the BQE, NYC DOT Commissioner Polly Trottenberg said during a tour with reporters on Friday. “This seam here is the line of the bridge infrastructure,” she said, pointing to a diagonal line cutting across the sidewalk. “There are 21 bridge structures, and this one is in the worst condition.” Harry Chapin Playground, which is actually on a bridge, would be temporarily demolished as well, she said. “We would build a permanent span to replace this bridge and run the traffic across it while we’re working on it down below,” Robert Collyer, DOT Deputy Commissioner of Bridges, told reporters. Though DOT favors the six-year approach, the Environmental Impact Statement “makes the final decision,” Collyer said. What About Squibb Park Pool and Bridge? The use of eminent domain is not yet being considered at the moment, Collyer said. But he did not rule out that some Columbia Heights residents may have to temporarily move out of their apartments. “We will need to utilize parkland … and we’re looking to make it better before we leave.” Yards next to the Brooklyn Bridge will be used for “lay down areas,” he said. Sections of Van Voorhees Park may get worked on as well. Any pollution abatement measures for people living next to the new highway will come out of the environmental impact study, Collyer said. The Promenade could be made permanently wider following the BQE rehab. “That will come out of the environmental study and what the people want,” he said. DOT officials and reporters donned hard hats to tour inside the BQE’s cavernous interior. Tanvi Pandya, project manager with the city’s Department of Transportation, pointed out cracks, rust, exposed rebar and stalactites made of calcium leeched from the highway by years of salt spreading, hanging like ice cycles from the ceiling of the BQE’s many interior vaults. “Another issue we have with the structure is everything you see is concrete. There are no steel girders to provide separate support. If you need to remove a section of that deck to repair it … there’s no superstructure to hold the rest of it in place,” she said. “We know there are going to be huge community concerns and we recognize that the impact of a project like this is very big. It also has huge implications for traffic and the economy of the whole city,” she said. DOT will be holding a town hall on Sept. 27, “and we want to hear from everybody,” Trottenberg said. The event will be held at the National Grid Auditorium (1 MetroTech Center, 2nd floor) at 6:30 p.m. There will be more town halls, workshops and meetings with large and small groups in the future. The environmental assessment process will take about two years, Trottenberg said.